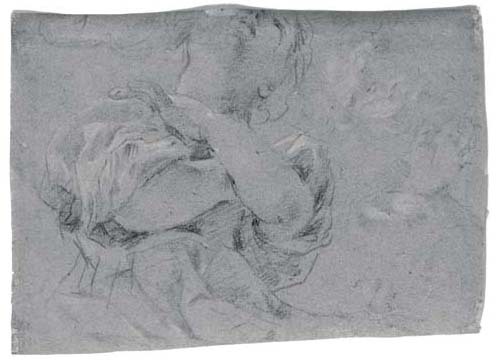 E. Schleier, Disegni di Giovanni Lanfranco, Florence, 1983, p. 154, under no. 30. E. Schleier, 'Disegni inediti di Lanfranco', Antichità viva, XXII, no. 2, 1983, 47-48, figs. 16-17. This sheet contains studies for three contemporary Roman projects. On the recto is an angel with crossed arms which is a study for one of the adoring angels in the Triumph of the Cross for the ceiling of the Cappella del Crocifisso in Saint Peter's (1629-1632). Also on the recto are studies for figures in the altarpiece of The Martyrdom of Saint Lucy in the Church of Santa Lucia in Selci, dated by Schleier to circa 1632. These include the left hand of the saint and the head of the child located among the spectators at the extreme right. On the verso is a study for the head of the Virgin in the altarpiece of the Adoration of the Shepherds (1631) formerly on the fourth altar on the left in the Church of Santa Maria della Concezione, Rome. The additional forms on the recto are believed by Schleier to relate to the drapery of Saint Lucy.